Reflections and Ruminations: Have you ever heard yourself say “I don’t like the God of the Old Testament”? This blog is for you. Have you ever heard yourself say “I don’t like the God of the Old Testament”? This blog is for you. 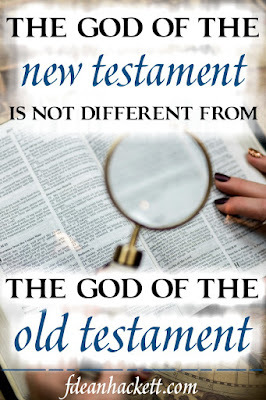 Variations of this are statements like “I like the God of the New Testament, but I don’t like the God of the Old” or “God in the Old Testament is hard and demanding but Jesus shows God as merciful and loving”. I’ve even heard one which says that “God in the Old Testament seems to have a need to smite people, but he seems to have stopped that in the New Testament. He is a changed God”. I often smile at statements like that last one, because saying that God has changed simply denies one of the most fundamental attributes of God that he is immutable. I have issues with these statements, even if one uses the phrase “appears to be” as a caveat for such statements made about God, largely because the questioner only takes selective verses from the Bible to support what they are saying, and often fail to do what is so important – read Scripture from a birds’ eye view and see Scripture as a collection of many books, written by particular individuals who were inspired by God. Each had a particular encounter with God and each encounter needs to be seen as God revealing himself slowly and progressively. Just as there are statements or verses in the Old Testament that do show God’s wrath, anger, jealousy and predilection for a good smiting of his recalcitrant people, there are also numerous Old Testament references that show otherwise. Nehemiah 9:17 reminds us that God is one who forgives, and who is gracious and compassionate, slow to anger and abounding in lovingkindness. Turning to Psalm 36, 69 and 17 will show that God’s people also saw him as God who compassionate, taking us in the shelter of his wings and Isaiah also highlighting God’s hesed, which is Hebrew for lovingkidness. Moreover, with tender images of God being the caring shepherd who tends to his sheep, a potter giving shape to and moulding clay, or that he is the rock of their salvation and a mother nursing a child at her breast, how can one say that the Old Testament images of God are only ones that show a wrathful and petty God? 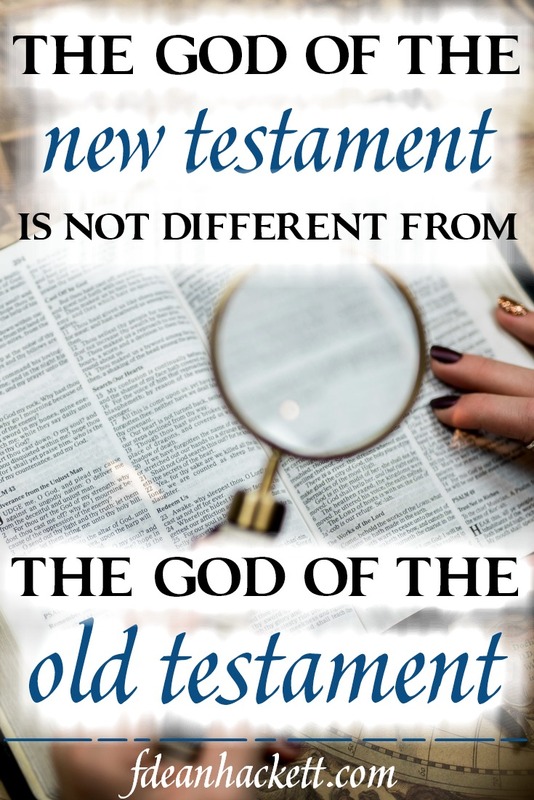 So, it really isn’t true at all that the God portrayed in the Old Testament is so unlike and so different from the God who Jesus reveals in the New Testament. What we must not forget is that from the time before the New Testament existed in its written form, the early Christians already believed that their faith in Jesus was rooted, based and steeped in the writings of the Old Testament. So Jesus himself read and prayed the Hebrew Bible and he was certainly not oblivious to the God who is portrayed there. This was the same God who he continued to worship and love as his beloved Father. Just as God writes straight with crooked lines in our lives, so too does he reveal himself to human beings in scripture. Each of the prophets and writers of the Old Testament books had different facets and dimensions of God’s attributes and reality, like the way a diamond from different angles refracts different shades of brilliance, colour and light. It is undeniable that many of the prophets’ roles in the Old Testament were to be messengers of punishment. But this conveyed a reality that all our actions, particularly those that were blatant flouting of God’s directions and instructions, had consequences, with some being more dire than others. As much as God is a God who is full of mercy, God is also a God who is also the fullness of justice. That Jesus only preaches and reveals a God of love who is going to permit anything and everything reveals not only a very shallow reading of Scripture, but a very selective one as well. Parables like the rich man and Lazarus, the ungrateful steward, and Matthew 25 are rich portrayals of a truth that there are serious consequences that await those who are not willing to love their neighbor deeply. I’m afraid that the God whom Jesus reveals isn’t the divine pushover that so many make him out to be. The role of the prophets wasn’t only to be prophets of doom. They were also called to show the merciful and tender side of God as well. The call to repentance of his sinful people need to be seen as a revelation of his love as well. In the Genesis story, the fact that the writer shows God making clothes to cover Adam and Eve’s nakedness is his way of showing that God doesn’t just eject them from Eden with nary a care or concern. The image of God as a Divine Couturier is a very tender one indeed. As much as disobedience has consequences, it doesn’t in any way make God uncaring and in any form of a snit. There is a Latin phrase that goes ‘quidquid recipitur ad modum recipientis recipitur’, and it translates into modern day parlance as “whatever is received is received according to the mode of the receiver”. Could the problem of seeing God only as vengeful and wrathful be because we who read the scriptures have a predilection to be such ourselves, projecting onto God these negative traits and magnifying them, and in that way, justifying our own shortcomings? In truth, there are no two different Gods in both testaments. They are one and the same, and overemphasis on either his mercy or his justice, with one at the expense of the other, will end with either a fickle God, a pushover God, or one who is simply a control freak. Thank you Father! - I cannot agree with this more......but the “Book of Life” is not an easy read and firm but gentle guidance is indeed a prerequisite if one takes on this venture. In my school days, the teachers of Catechism seemed to be at great pains to make sure- we, their young charges, were schooled thoroughly in this imagery of a God of thunder and brimstone. How we trembled when castigated for inattentive-ness by stories of being turned into pillar of salt like Lot’s Wife. So these stories of a wrathful and punishing God were the norm - is it any wonder that it puts one off -getting to know more about this angry God? What is worse- as parents we inevitably perpetuate the same dark myth to our children - unless we are re-catechized. In that “un-enlightened” era even some Sunday homilists would sometimes use this form of preaching to cow or on their “cowering” flock. So it is a step in the right direction when blogs like yours help to clear up such fallacies or rather the mis-conceived idea of a wrathful God. Of course, bible study courses in the parishes help but not everyone has the privilege of time on their hands to do so. Another truth you pointed out (in the above quote) refers to the fact about each individual writer’s God-encounter and how his narrative enables God to reveal himself “slowly and progressively.” I remember how my foraging into the prophets and psalms - (for I have a weakness for poetry & poetic-prose) - won for me a gem in Ezekiel 16:6 onwards - where the God of the Old Testament allowed his great love and compassion for Israel ( substitute for self) to let himself feel hurt and betrayal . It was a water-shed moment for me - from thence to pursue the search of this God who is LOVE itself in the Scriptures. Is our Passion weak on Passion Week?